A $1.3 trillion industry, the US nonprofit sector is the worldвЂ™s seventh largest economy. From art museums and university hospitals to think tanks and church charities, over 1.5 million organizations of staggering diversity share the tax-exempt 501(c)(3) designation, if little else. Many social justice organizations have joined this world, often blunting political goals to satisfy government and foundation mandates. But even as funding shrinks and government surveillance rises, many activists often find it difficult to imagine movement-building outside the nonprofit model. The Revolution Will Not Be Funded gathers original essays by radical activists from around the globe who are critically rethinking the long-term consequences of this investment. Together with educators and nonprofit staff they finally name the вЂњnonprofit industrial complexвЂќ and ask hard questions: How did politics shape the birth of the nonprofit model? How does 501(c)(3) status allow the state to co-opt politi-cal movements? Activists or -careerists? How do we fund the movement outside this complex? 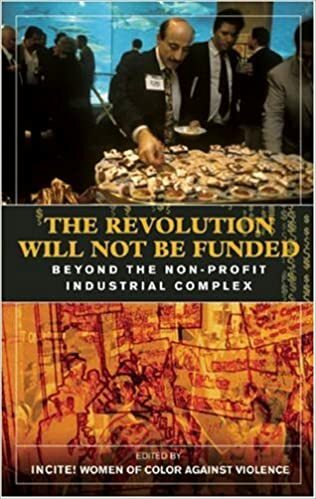 Urgent and visionary, The Revolution Will Not Be Funded is an unbeholden exposГ© of the вЂњnonprofit industrial complexвЂќ and its quietly devastating role in managing dissent. manipulative funding shift would actually win them more enemies than friends. Further, because CARA was a community-organizing program, we had, by this time, successfully built a significant base of supporters, who deluged the mayor and city council with hundreds of letters, phone calls, and e-mails, pressuring the council members to come up with a different plan that did not include reducing our funding so drastically. Ultimately, CARA was saved. We call this tactic "having each other's backs."